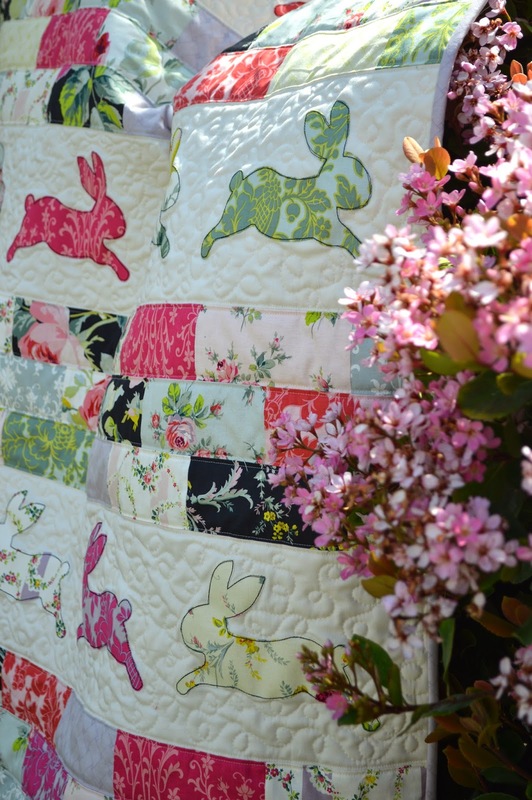 I am so excited for spring and Easter and flowers and bunnies and sunshine! I am a cat person by nature, but when spring rolls around my obsession with cats turns into an obsession with rabbits. I have rabbit "nick-nacks" all over the house!!! 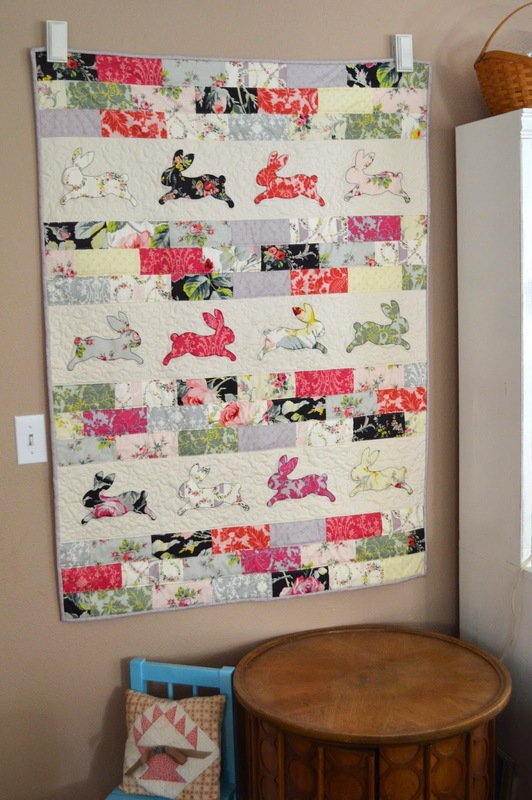 A new bunny wall quilt is long over due! 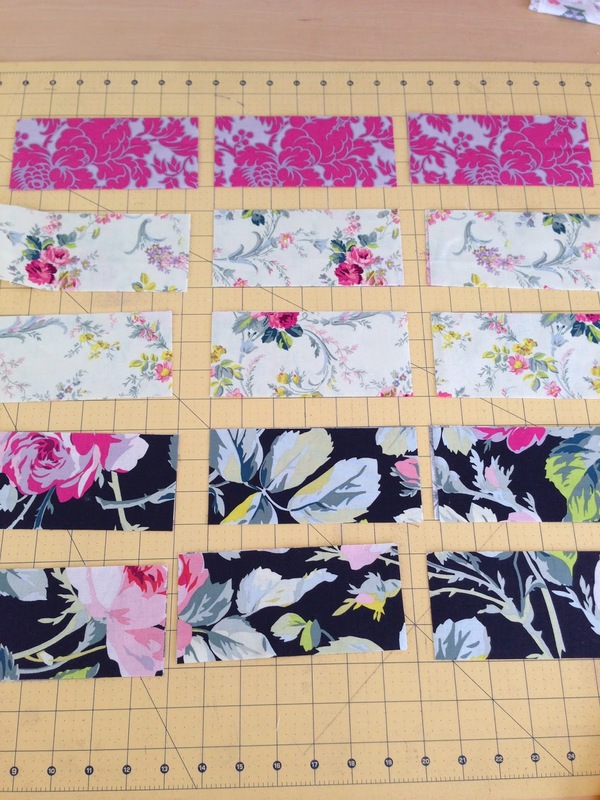 When I came across this amazing line of fabric from Anna Griffin, called Grace, I fell in love. It feels like vintage spring!!!! 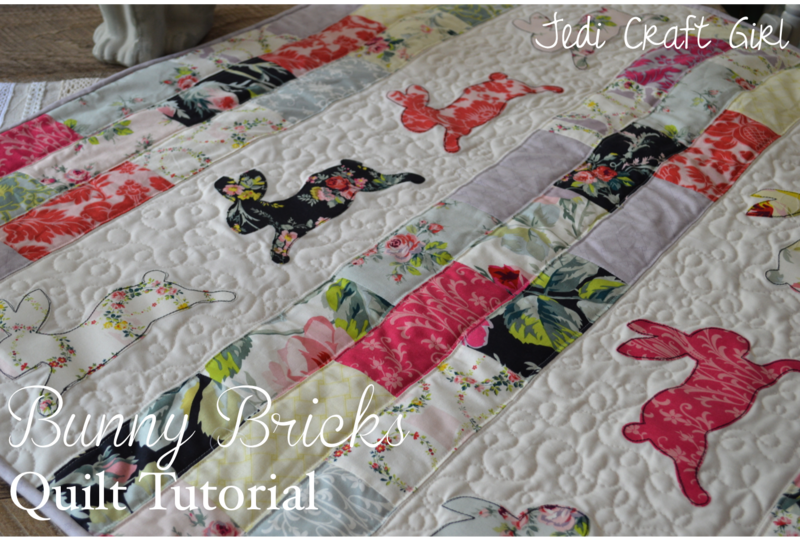 I paired the rectangle "bricks" with a bunny silhouete appliqué from Sizzix. I'm in love! The bricks measure 3" x 6.5" each. Stack them into piles. Begin making pairs out of the bricks and chain piecing them; leave about 12 single bricks. Pair up 12 of the pairs with 12 pairs, and so on. The goal is to have 12 rows of 7 bricks. I went pretty random and did not lay the pattern out ahead of time. Here you can see my 12 rows. 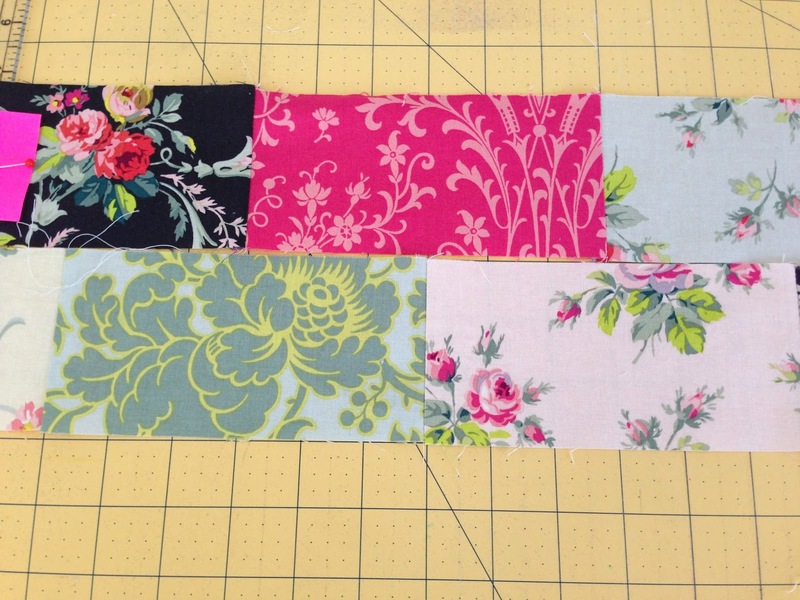 The rows will be sewn into sets of 3's. Press the seams of the bricks to one side. To sew the rows together the bricks need to be offset just like in real masonry work. 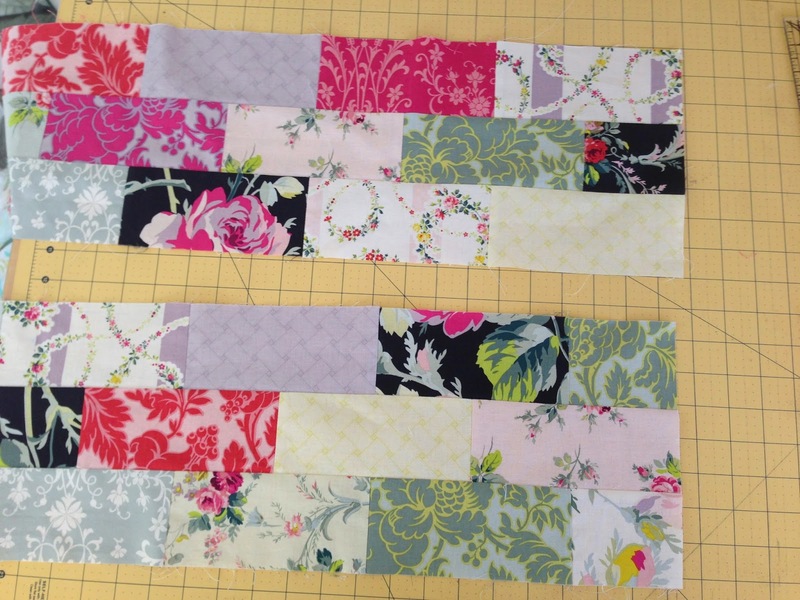 Align one of the rows on your cutting mat. Each brick should measure 6" (except for the end ones.) Align both seams of the brick with the 6" marks on the cutting mat. Take the next row and align the seam along the 3" mark which is the center of the first brick. Put right sides together, pin, and sew using 1/4" seams. 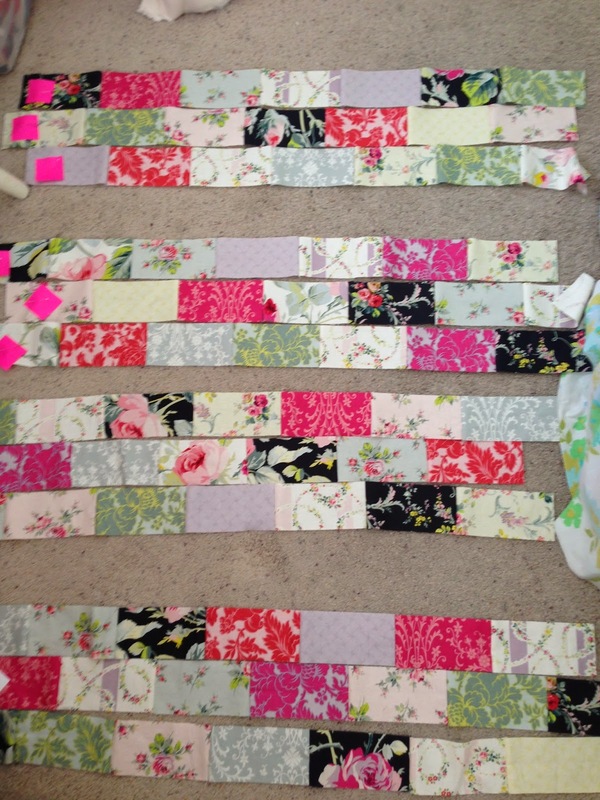 Continue sewing the rows together in sets of 3's. The ends of each row will be uneven because we are offsetting the rows. 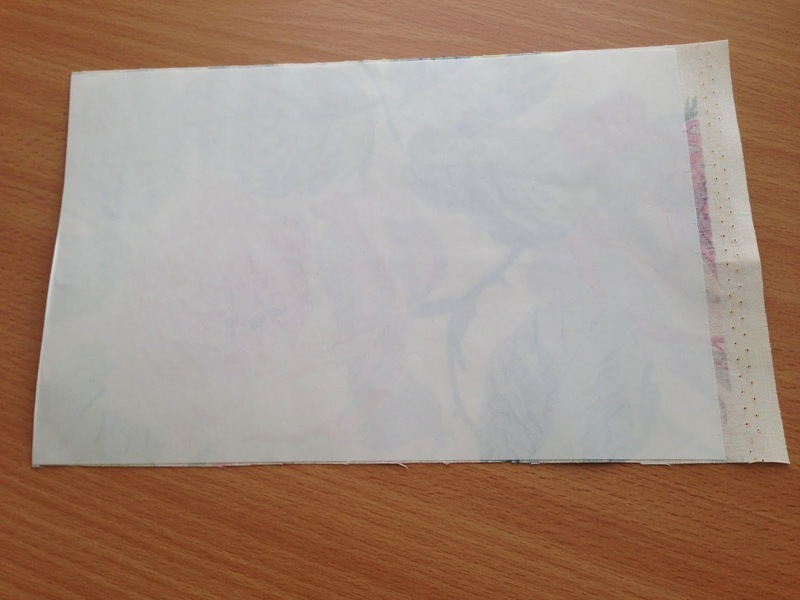 Once the rows are sewn, press seams to one side and "square up" the edges (below). Cut the cream cotton into (3) strips 8" x 39.5". 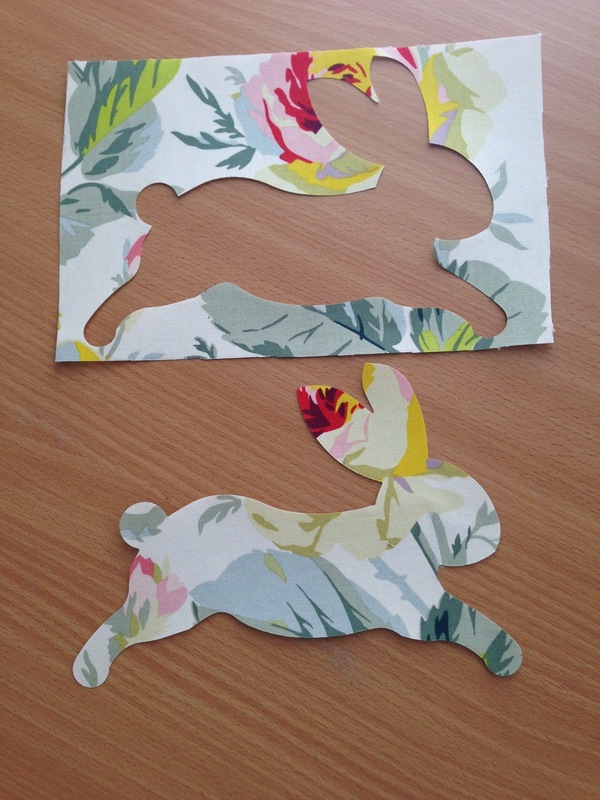 This will be the bunny appliqué pieces. 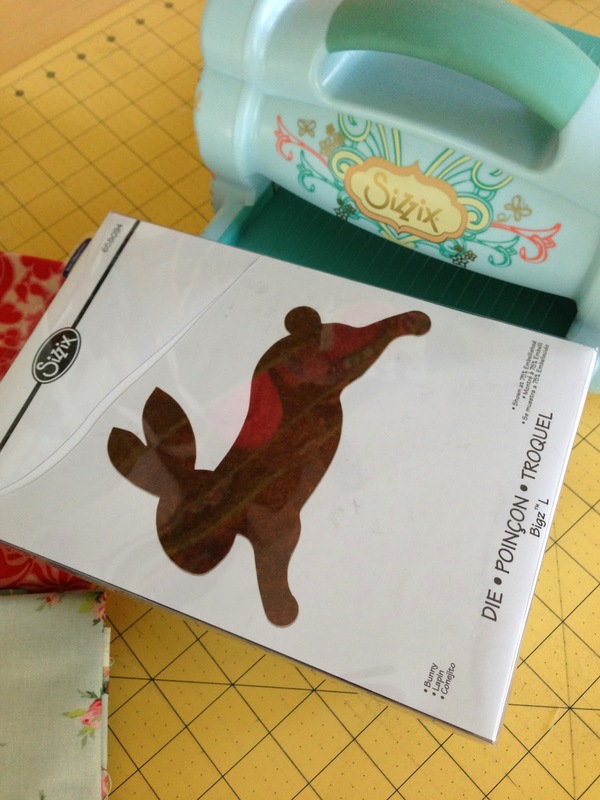 Cut the bunny fabric and Heat n Bond roughly the size of the Sizzix Die. Iron Heat n Bond Lite to the wrong side of the fabric. Run the fused piece through the Sizzix to cut the bunny. I cut 2 at a time. I was completely in love with each and every bunny that I cranked out!! Peel the backing off the Heat n Bond Lite and position the bunnies as desired. I alternated the direction of the bunnies in each row. Iron the bunnies into place and top stitch twice around each bunny using black thread. 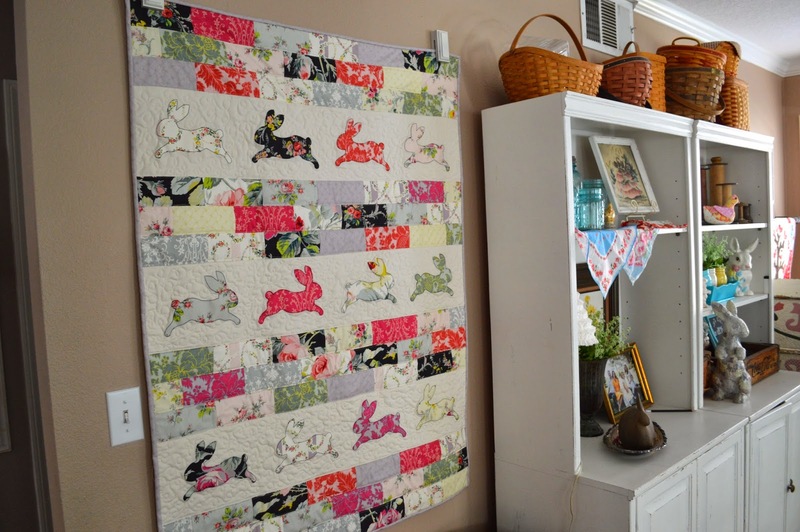 Now that the quilt top is finished, quilt as desired! 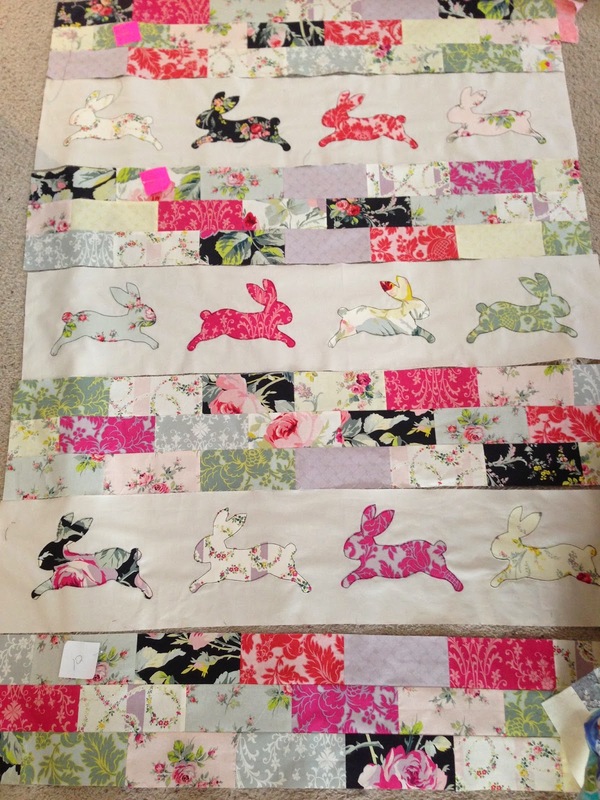 I quilted straight lines in the "brick" part and "loop-de-loos" in the bunny part. I am so happy every time I see it! This is just the cutest and this bunny collector may sneak in your home and bring it back to St.Louis with me! ;-D I love it! eeks! SO cute - I need bunny pillows!!! Absolutely love this! 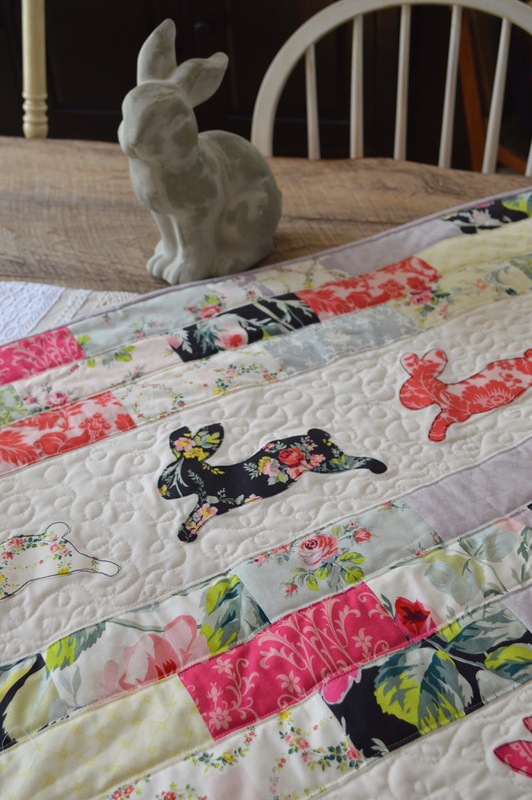 It's the perfect baby quilt for a little girl. 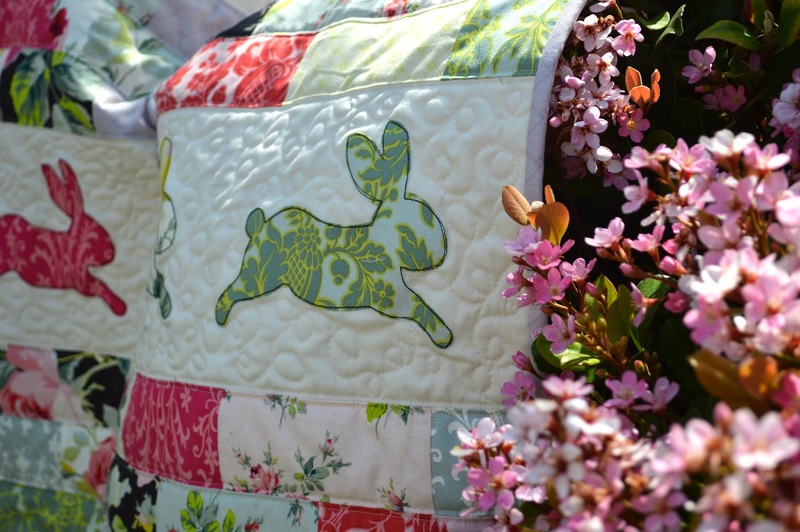 I love, love love your bunny quilt! It is just adorable and I can just see all those bunnies scampering thru the flower garden. I want to make one of these so bad. Great job!! Adorable, fantastic, brilliant, happy, hoppy bunnies!!! 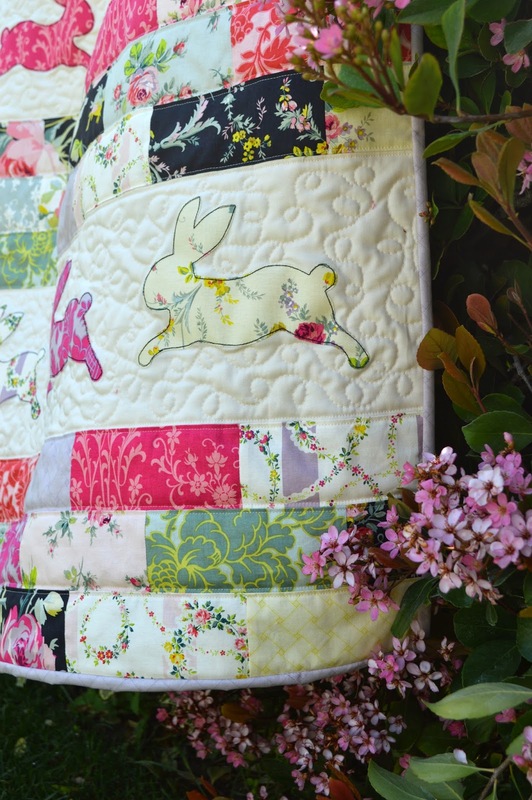 I haven't seen the bunny die anywhere, now I have a new search...this quilt is perfect.